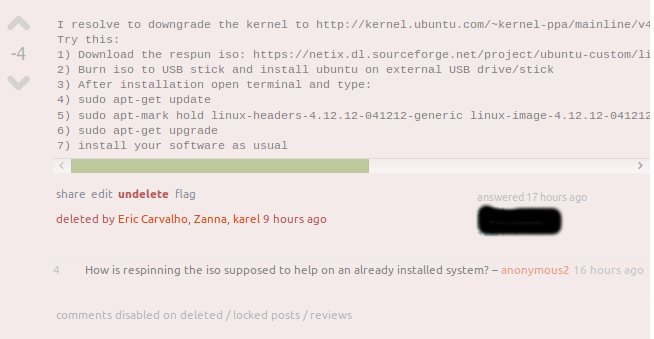 All five answers seem to say that respinning the ISO and downgrading/upgrading the kernel fixes sound. Many of them also are saying to use a specific tool. Please could we have them deleted - they are all Not An Answer (I have flagged them as such) and a number are spam (use this re-spinning tool). This user does have another answer: HP Pavilion X2 10 sound not working on Lubuntu. While this does not include respinning (which as Thomas Ward points out does not help on a existing Ubuntu installation), it is still a low quality answer. This answer is not an answer(!) but a comment on your answer that is too long for the comment character limit. Users with more than 20k are able to vote to delete negatively scored answers, or answers with a score of zero when reviewing them in the Low Quality Posts review queue. An answer requires three delete votes from such users, and the names of those who cast effective delete votes are displayed as can be seen above (presumably for transparency). Both Eric Carvalho and myself encountered these posts through the review queue (as can be seen from the reviews, for example this one) and clicked the Delete button (Recommend deletion for those who don't have delete voting privilege yet, or for everyone when the post has a positive score). karel and muru voted to delete the posts later, likely after reading your meta post here. Since three delete votes had been cast on them, the posts were deleted and the reviews were "invalidated" (as shown on the post timelines, for example this one) before they had been completed. The three users who were able to cast delete votes were able to do so because those posts had been flagged and brought to attention on meta by yourself and others. Users who downvoted, or who commented (such as anonymous2, David Foerster and Thomas Ward ♦) made it more obvious that the posts should be deleted and those who recommended deletion (including yourself and stumblebee) thus helped to raise the posts in the review queue, and their votes would have been directly effective towards deleting the posts if the final required vote had not been cast before other reviewers had voted to recommend deletion. For my own part I thank you for your kind thanks, but that part was a small one, very much less than 1/3 of the effort expended on the task. Thank you and thank you to all those who participate in moderating Ask Ubuntu. What is the difference between the 'sound' and 'audio' tags?